Sigenics is involved in community activities in and around both their Chicago, IL and Irwindale, CA locations. In Chicago, Sigenics is involved in mentoring interns and summer students from our historic Bronzeville neighborhood, as well as supporting and supervising educational enrichment programs in science, engineering, and music in local public schools in the Chicago area. 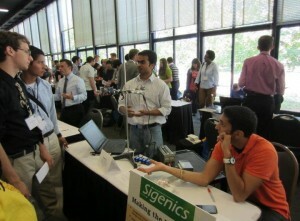 On the campus of the Illinois Institute of Technology, Sigenics engineers act as technical advisers to IIT students in the Inter Professional Projects Program (IPRO). Sigenics engineers work with IIT students to help the students define the electrical engineering portions of their projects and find practical approaches to accomplish their engineering tasks. In California, Sigenics CTO Doug Kerns serves as a member of the Rotary International Club of Sierra Madre. The club is involved in various projects including water conservation efforts in Sierra Madre and clean water supply projects in Cambodia and India. Below: Tarun (standing) and Kevin (seated) demonstrate how a Sigenics EMG sensor is used to control a robotic hand (mounted on stand) using muscle signals detected in Kevin’s right arm. The demonstration was made for high school students at the Boeing Scholarship Academy event held on the campus of The Illinois Institute of Technology.